Grape seed oil is produced from pressing seeds of the grape species, Vitis vinifera. After juice is extracted from grapes, 6-10% of the weight of pressed grapes is an oil . The bulk of grape seed oil is found in Italy, France, and Spain where wine making is prevalent. This oil is known to have a pleasing, sweet scent . It is commonly used as a carrier oil, as it is suitable for all skin types. The oil is light and absorbs readily, making it a good massage oil . Grape seed oil is highly emollient, meaning it softens the skin. This is due to the high content fatty acids that maintain skin barrier function and protects against loss of moisture. The most abundant fatty acid in grape seed oil [70% of total fatty acids] is linoleic acid, an omega-6 essential fatty acid [6, 8]. Grape seed oil has the second highest linoleic acid content found in vegetable oils, only exceeded by safflower oil . Linoleic acid cannot be made by the body and thus, it must be supplemented. Deficiencies in linoleic acid result in dry, scaly skin . Linoleic inhibits COX-2, an enzyme that produces prostaglandins, immune mediators . Thus, it has anti-inflammatory effects. Decreased amounts of linoleic acid are thought to increase acne . Grape seed oil also contains a moderate amount of oleic acid, an omega-9 fatty acid. Oleic acid is another fatty acid known to increase skin health with anti-oxidant and anti-inflammatory properties. This oil also has a high vitamin E content . Specifically, it has high levels of α-tocopherol and γ-tocotrienol, two types of vitamin E . Vitamin E has excellent anti-oxidant properties. It protects the skin against lipid degradation from UV and ozone exposure. This damage is associated with skin aging. Vitamin E is also anti-inflammatory, increases collagen, and decreases collagen degradation . Grape seed oil also contains phytosterols that have anti-inflammatory effects. They help treat inflammatory skin disorders such as eczema . β-sitosterol is most prominent sterol in grape seed oil . Grape seed oil contains small amounts of polyphenols, a type of bioactive compound. Polyphenols have anti-oxidant, anti-inflammatory, and antimicrobial effects . Grape seed extract is known to have compounds called proanthocyanidins that are highly anti-oxidant, but grape seed oil contains none of these, as they are water-soluble and not retained in the oil phase. Another type of polyphenol, cathechin, is lipid-soluble, meaning this compound is extracted in the oil . Grape seed oil contains small amounts of epicatechin, cathechin, and trans-resveratrol . Resveratrol, a biomolecule, has anti-inflammatory, anti-oxidant, and anti-cancer properties . It increases wound healing. Cathecins have free radical scavenging abilities. Free radicals harm the skin and are known to cause skin aging. Grape seed oil protects against sun damage, activity that is attributed to polyphenols . 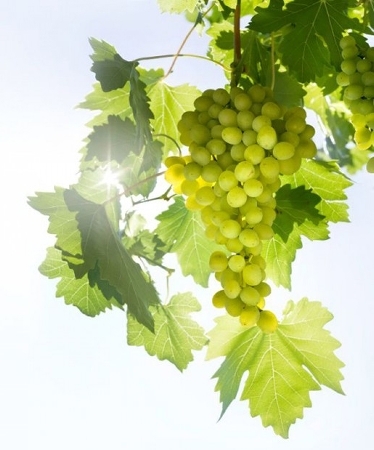 In a study using mice, grape seed oil showed anti-bacterial activity against E.coli . Scientists believe this effect is due to the polyphenolic compounds in grape seed oil. In the same study, grape seed oil promoted wound healing by increasing collagen formation in the wound when topically applied . Additionally, polyphenols are thought to inhibit matrix metalloproteinases [MMPs] that play a role in degrading collagen . C. Crews, P. Hough, J. Godward, P. Brereton, M. Lees, S. Guiet, and W. Winkelmann, “Quantitation of the Main Constituents of Some Authentic Grape-Seed Oils of Different Origin,” J. Agric. Food Chem. vol. 54, pp. 6261-6265, 2006. [5. T. Maier, A. Schieber, D.R. Kammerer, and R. Carle, “Residues of grape [Vitis vinifera L.] seed oil production as a valuable source of phenolic antioxidants,” Food Chemistry, vol. 112, pp. 551- 559, 2009. B, Matthäus, “Virgin grape seed oil: Is it really a nutritional highlight?” Eur. J. Lipid Sci. Technol., vol. 110, pp. 645–650, 2008. B.S. Nayak, D.D. Ramdath, J.R. Marshall, G. Isitor, S. Xue, and J. Shi, “Wound-healing Properties of the Oils of Vitis vinifera and Vaccinium macrocarpon,” Phytotherapy Research, vol. 25, pp. 1201-1208, 2011. J.E. Pardo, E. Fernandez, M. Rubio, A. Alvarruiz, and G.L. Alonso, “Characterization of grape seed oil from different grape varieties [Vitis vinifera]” Eur. J. Lipid Sci. Technol., vol. 111, pp. 188- 193, 2009. J. Shi, J. Yu, J.E. Pohorly, and Y. Kakuda, “Polyphenolics in Grape Seeds—Biochemistry and Functionality,” Journal of Medicinal Food, vol. 6, issue 4, pp. 291-299, 2003. J.J. Thiele, S.N. Hsieh, and S. Ekanayake-Mudiyanselage, “Vitamin E: Critical Review of Its Current Use in Cosmetic and Clinical Dermatology,” Dermatol Surg, vol. 31, pp. 805-813, 2005.